The Boylesports bookmaker tested, reviewed and rated: find all the necessary information about Boylesports (history, payment options, sports offered, bonus and free bets available, payout average, etc..). Join one of the Ireland's largest independent bookmaker! Boylesports is of the largest bookmaker in Ireland and has a license to operate on the web issued by the Government of the Isle of Man. The company was founded in 1989 by John Boyle, and was recognized for the high standard of customer service. The betting offer includes almost all types of sports from football to darts. Boylesports is a member of IBAS (Independent Betting Adjucation Service), what means higher protection for the players. Boylesports online offering is a pleasant experience. The site is easy to use and offers a wide range of sports betting. €20 Free Bet! Place your first bet and Boylesports.com will match your stake with a free bet up to €20. The offer is available only to residents of the following countries: Ireland, United Kingdom, Spain, Germany, Sweden, Australia, New Zealand, France, Canada, Monaco, Isle of Man, Gibraltar, Malta, Denmark, Finland, Norway, Cyprus, Bermuda, Cayman Islands, Liechtenstein, Austria, Luxembourg, Kuwait, Quatar, UAE & South Africa. 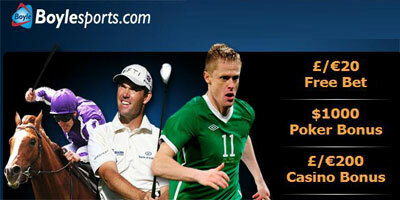 Open a new account with Boylesports !! !